Editor’s Note: One inspector says he can directly credit over 100 inspections in the past two years from simply handing out tape measures. Home inspection is a niche, but still a very competitive profession where home inspectors have to stay on the lookout for effective ways to market their businesses without breaking the bank. 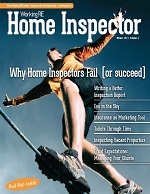 Home inspectors take many different approaches to their marketing, but sometimes keeping it simple pays off. Raymond Wand, a home inspector from Ontario, Canada says that giving out 50-page, 4”x5” scratch pads with his company logo has been effective for him, adding that, “It’s like handing out 50 business cards.” Still others say that fridge magnets work best for them. Meanwhile, some home inspectors swear by the tape measure—saying that it’s useful, long-lasting, and not likely to be thrown away. Home inspector Dan Harris, from Arizona, says he has experimented with a variety of approaches and found the one that works for him. “I’ve tried giving out coffee mugs, pens, note pads, chip clips, calculators and a few other trinkets, but the most effective tool that everyone seems to appreciate is tape measures,” says Harris. Harris says he can directly credit over 100 inspections in the past two years from simply handing out tape measures. It turns out that giving out tape measures is cheaper than you might think. Shrewd home inspectors can buy tape measures for $1 each when buying in bulk, then have a small label produced with company information for about for 10 to 20 cents, for a total cost per tape measure of under $1.50. Dan Harris says he can find 16’ tape measures at the dollar store for $1 each, and he’s found a place that can make stick-on company logos for .04 each, giving him a total cost of just over $1 each. Home inspectors, as small business owners in a competitive field, understand the importance of spreading the word about their businesses and finding affordable ways to grow their clientele. On that note, Dan Harris advises home inspectors to avoid spending too much on any one item used for marketing purposes and develop a targeted marketing strategy. Harris says that if you can focus your marketing dollars on promoting your own company, instead of a local home inspector association, and limit your expenses to $1 per “promotional product,” you are well on your way to developing a marketing strategy that maximizes your budget. 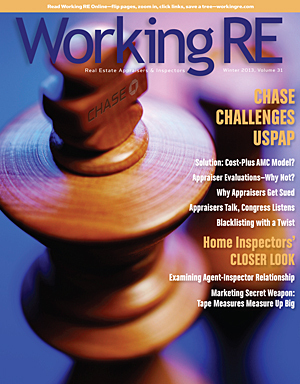 Isaac Peck is the Associate Editor of Working RE Magazine and Marketing Coordinator at OREP.org, a leading provider of E&O Insurance for appraisers, inspectors and other real estate professionals in 49 states. He received his Bachelors in Business Management with a Minor in English at San Diego State University. He can be contacted at isaac@orep.org or (888) 347-5273.